The long awaited release of WordPress 5.0 ‘Bebo’ has finally arrived! 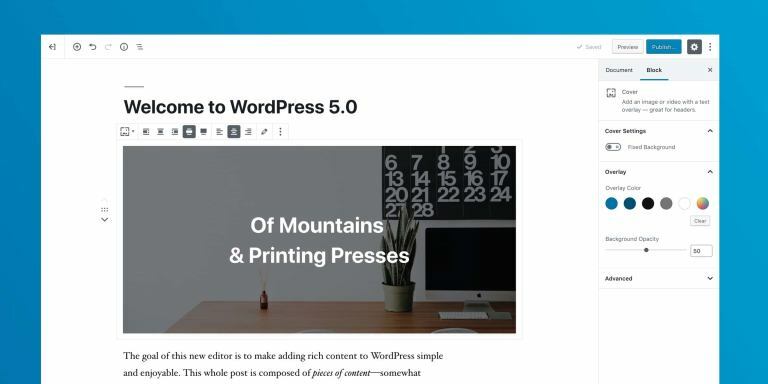 With the release of fancy new Gutenburg Editor your WordPress interface is going to start looking ALOT different! They have replaced the TinyMCE editor completely with new ‘blocks’. Check it out below! For existing, and especially older websites, be warned not to just rush into this update. It could have dire consequences for compatibility with your existing WordPress theme and plugins. For those who don’t like change, don’t panic! You don’t have to update to the Gutenburg editor… yet! You can still choose to keep using the same old compatible Classic Editor which you are used to. WordPress have confirmed it will be supported until 2021. Keen to try Gutenburg out? As mentioned this is a BIG update…. HUGE! To date, not all themes and plugins will be compatible (and some may never be!) so best to make a checklist of them all. Work through and check each to see if your website is ready for the update. Otherwise just sit tight as all the major plugins and theme updates won’t be far away! Alot of the major plugins also have exciting new updates in store! For ongoing peace of mind, subscribe to our WordPress Monthly Maintenance Package to ensure you always have the latest security and technology updates.